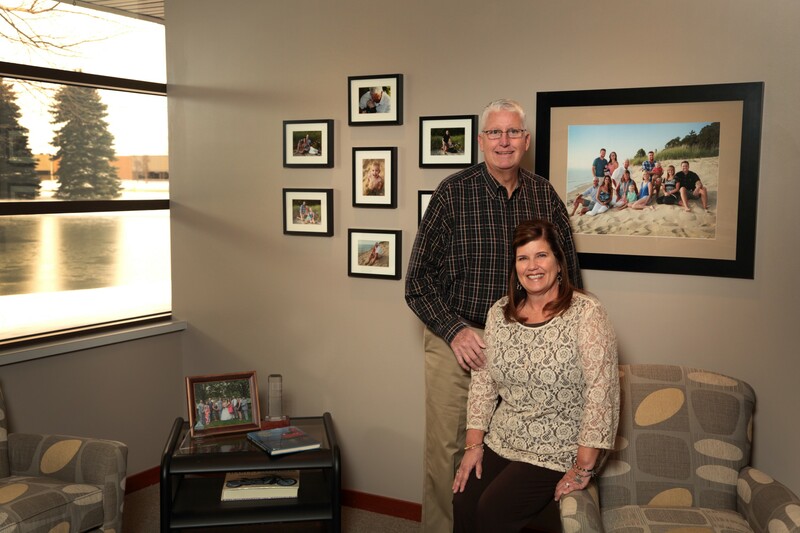 In 2015, we welcomed Scott and Mary Nykerk to the Foundation’s Bridge Builder Society. Members of our Bridge Builder Society have made a long-term commitment to the future of Holland/Zeeland by naming the Community Foundation in their estate plans. Part of the Nykerks’ commitment is designated for our Community’s Endowment, and qualifies as one of our 100 new “tomorrow” estate gift commitments as part of our Today. Tomorrow. Forever. campaign. They also made a pledge in support of the “today” portion of the effort. “We feel so blessed to have been born and raised in this area. Giving, both now and through our estate, is a way that we can be sure this community will continue to bless others,” said Scott Nykerk. The Nykerks are true Zeelanders. Even before they knew each other, they both attended the same church in Zeeland with their families. They met at Zeeland High while working on the school yearbook when Scott was a senior and Mary was a sophomore, and have been together ever since. After Scott finished his architecture degree at Ferris State University, the two married and furthered their roots in Zeeland by starting their family there. “The best blessings are the ones money cannot buy,” noted Mary, referring to their four children and their wonderful families, three of whom still live locally. Included in the best blessings are extended family, close friends, and many others they’ve met along the way. The success of Scott’s business, Lakewood Construction, has been an added bonus. Scott launched his career there 33 years ago, pricing and bidding jobs, when the local architecture industry was slow-moving. He became part owner just two years later. This year, the company is celebrating 45 years in business. Scott and Mary have been married for 38 years and have been giving back since they were first married. “Giving was instilled in us through our parents and our church, and then spread outward,” recalled Mary. The Nykerks have a heart for helping children, families, and causes that teach skills and help instill a strong work ethic. Many of the causes they support are faith-based. Scott and Mary served on the Hospice of Holland event planning committee for more than twenty years. The Nykerks became involved in both Hospice and the Foundation after learning about the organizations through close friends. “Word of good work spreads. So many of the people we know are also giving back, both personally and through their businesses. Getting to know more people in the community has furthered our giving interests. Through friends and connections, we’ve learned of more needs and organizations close to our hearts,” said Scott. The Nykerks organize some of their charitable giving through the Foundation. In 2015, they established a Donor Advised Fund, the Scott and Mary Nykerk Family Fund. The Foundation is also helping the Nykerks with their giving beyond their lifetimes by administering the charitable portion of their estate. Scott and Mary have specific local organizations they want to continue supporting, and the Foundation will administer those gifts on their behalf, according to their pre-designated wishes. “We love knowing that this is taken care of. We’re confident our wishes will be carried out because we trust the Foundation and its rich history. And, if our charitable wishes change, it’s extremely simple to update. It was an easy process,” said Mary. Through their involvement in Hospice, the Nykerks learned the importance of passing on the concept of giving from generation to generation. They instilled giving traditions in each of their young children, giving them dollars to designate to a charity of their choosing during the holidays. “The future depends on our kids, so for us, we wanted to teach them about it as soon as possible, and to give them a voice in giving decisions,” Mary said. “We want Holland/Zeeland to continue to be great long into the future, and that’s why we’ve designated a portion of our estate for the Community’s Endowment,” said Scott. “It makes such a difference when people pool their resources together for greater impact,” Mary agreed.